Director Stuart (Cool Hand Luke, The Pope of Greenwich Village) Rosenberg's Amityville Horror certainly isn't a masterpiece, and it's not likely to win over a lot of younger, more superficially-oriented horror fans. There isn't much gore to speak of. There aren't mega-budget special effects. The film isn't edited for the MTV generation--that is, its pace has more in common with Robert Wise's The Haunting (although it isn't quite the stinker that that film is) than Evil Dead. What it does have is a deliberate, gradual descent into a mood that threatens to become eerie, but remains disappointingly inert. When it works, and it does occasionally, its because the cast and crew are skillful enough to make what could be unintentionally amusing subtly convincing instead. Infamously, The Amityville Horror was reported to be a true story. Most of us didn't believe that when Jay Anson's book first came out, even if we loved the story and found it entertaining (I sure did). Even for those more inclined to believe in supernatural stuff, the Amityville story has been effectively debunked by authorities like Dr. Stephen Kaplan (check out his book, "The Amityville Horror Conspiracy" if you're interested; it was entertaining reading as well). The part that we know to be true, and how the film begins, is that Ronald DeFeo murdered his parents and four siblings in a bucolic home in Amityville, New York. Not too long afterwards, George (James Brolin) and Kathy Lutz (Margot Kidder) moved in with Kathy's three children. The Lutz's only lived there for a short period of time and (here's the fiction part) were quickly and increasingly terrorized by poltergeists and other evil spirits that inhabited the home. 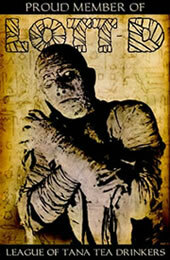 The film, as you'd expect, retells some of the details of the supposed haunting from Anson's book. For most of the film, one thing that Rosenberg does right is to leave most of the odd happenings surrounding the home open to wide interpretation. Not that I'm opposed to balls-to-the-wall effects and overt supernatural occurrences in film--hell, I absolutely loved the 1999 remake of House on Haunted Hill--but I think Rosenberg's style here is suited to the reality of the Amityville case. Is George Lutz just going a bit wacky, or is there something alien going on? Either way, at its best The Amityville Horror is pretty creepy, whether we have to watch out for spirits with glowing red eyes popping up when we least expect them or hope that George keeps his cool while he's holding that axe. Rosenberg excels at subtlely suggesting the increasing disturbances. On the other hand, most of them are from the "how to make a haunted house film" manual, especially the subsection dealing with demonic possessions. We get the inexplicable infestations of flies, bleeding walls, bleeding catholic icons, cold drafts, illusory aging when a character gazes at themselves in the mirror, etc. If done right, this stock material can work well--it's never bad in my opinion just because it is stock--but The Amityville Horror tends to lack atmosphere, passion, and commitment. As often or perhaps even more often than you'll feel chills or become deeply engaged with the story, you're likely to feel that Rosenberg is going through his bulleted list like a proofreader. 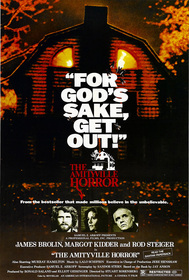 I wanted to love The Amityville Horror. I loved the book, and I love the haunted house and Satan/demonic possession subgenres. This film is definitely worth a look by horror fans, but just don't expect it to come without dings, scratches and in need of a new paint job. A Reverend Thomas Bermingham is credited as Religious Supervisor. He also consulted on The Exorcist. Submitted by Dragonsand (not verified) on Tue, 2010-11-30 14:12. Ok, this movie scared the hell out of me. I don't know if it's because the house in the film is not far from where I grew up in NJ or the fact that I've been in the real house. It's a great movie and a good scare. Submitted by Jimmie P (not verified) on Sat, 2012-03-03 07:34. "its pace has more in common with Robert Wise's The Haunting (although it isn't quite the stinker that that film is)"
I had to stop reading after that. ARE YOU SERIOUS?! Where does Classic-horror get you people from? The Exorcist panned, The Haunting is a "stinker"... I guess your idea of a "good" horror film must be Paranormal Activity or Thir13en Ghosts? Pathetic.